I'm a sucker for sidequests in Ni no Kuni. I blame the stamps. In the game, each time you do a sidequest, you get a number of "merit stamps" on your stamp-card, and if you fill out a card, you can trade it in for power-ups. The tougher the sidequest, the more stamps you get. This system is good. So, so good. I don't know why exactly, but I CANNOT GET ENOUGH STAMPS. 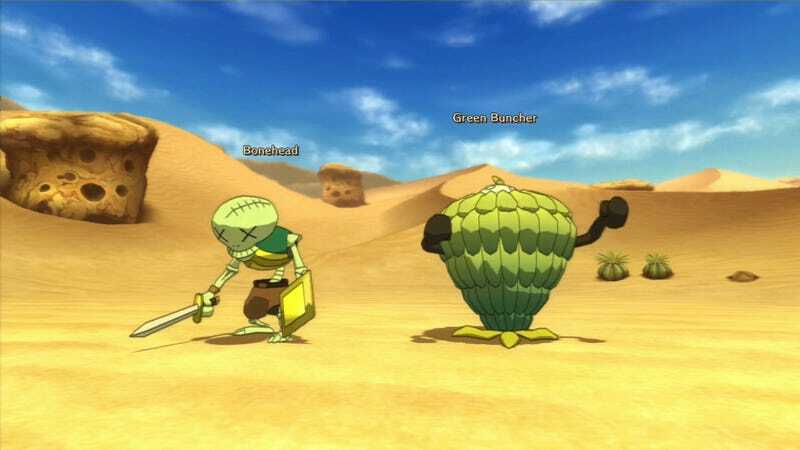 One of the sidequests in the second city of Al Mamoon required me to track down and capture two specific beasties from the world—a little purple Turbandit and the walking banana-bunch that is called a "Green Buncher" but which I have taken to calling the Fighting Bananamonster. Sometimes at the end of a fight, a defeated enemy will hang around at the fringes with hearts coming off of its head. That means it's time for you to quickly switch over to Esther and play it a song, and you can woo it into your expanding menagerie of beasts. I usually take these as they come, but the sidequest required that I capture two specific beasts. I already had a Turbandit, so it was time to go farm some Fighting Bananamonsters. The only problem was, I was high enough level that every monster in the desert part of the world map would run away from me when I'd draw near. That could make running down Bananamonsters tricky—they're not very fast, but as I chased them, if one saw me while I was still a ways away, it would often vanish into thin air just as I caught up to it. Which brings me to my one Ni no Kuni tip, which I discovered by accident. If you're farming monsters and get spotted, just hit square or triangle to call up a menu, then return to the game. The monster will "forget" it saw you and resume a regular walking pattern, which will make it a cinch to catch. Sure, it's maybe less a "tip" and more a "minor bug/exploit," but when you're thirty minutes into a farming run and the stupid bananamonsters just won't fall in love with you no matter what, you might find it very nice to know. It still took me about a half-hour or more of farming, but eventually I did catch that Fighting Bananamonster, and I turned in the sidequest for some sweet, sweet merit stamps. So there it is: My one Ni no Kuni tip. If you'd like a bunch of other useful pointers, go check out Jason's tips article. Okay, brb, gonna go get some more stamps.